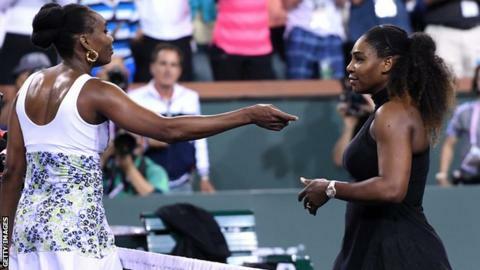 Serena Williams say she has "a long way to go" on her comeback after the birth of her child following defeat by sister Venus in round three at Indian Wells. The former world number one hit four aces but had her serve broken four times in a 6-3 6-4 loss in California. "It wasn't easy, obviously," said Serena, who was in her first event since beating Venus in the 2017 Australian Open final. Venus moves on to the last 16 where she will face Anastasija Sevastova. Latvian Sevastova beat German Julia Goerges in straight sets 6-3 6-3. It was the 29th meeting between the Williams sisters - Serena now leads 17-12 - and it lasted 87 minutes in front of a main stadium crowd of more than 10,000 fans, including current world number one Simona Halep. Serena, 36, saved a match point against her elder sister but hit a forehand long to end the contest. "It was good to play and try to get in the rhythm and get into the swing again," added Serena, who gave birth just over six months ago. "I can't really replicate the situation no matter how much I do in practice. I make those shots 10 times out of 10 in practice. "It's just the nerves, the anticipation you feel naturally. It's a little bit of everything that comes in a match that just doesn't normally happen. "It's good that I don't have to say that this is the best tennis I have ever played and I lost. My room for improvement is incredible. "So I have just got to keep saying at each tournament that my goal is just to be better than the last. I don't want to go backwards." Serena was already pregnant with daughter Alexis Olympia, who was born on 1 September, when she beat Venus 6-4 6-4 in Melbourne at the start of 2017. However, she revealed in February that she "almost died" after giving birth and was bedridden for six weeks. This was a match that even the world number one wanted to watch. Simona Halep, who is due on court at 11:00 local time on Tuesday for the first match of the day, joined more than 10,000 fans to watch the 29th meeting between the pair. Serena may have won eight of their previous nine matches, but it was apparent from fairly early on that Venus was the stronger and steadier this time around. Venus' double fault count accelerated as Serena threatened to stage a late fightback, but the number eight seed was playing at a level her sister can't yet match. But this was still a hugely encouraging week for Serena. She heads to the Miami Open with three matches under her belt, and still with plenty of time on her side until the summer's run of three Grand Slams begin at Roland Garros in late May.